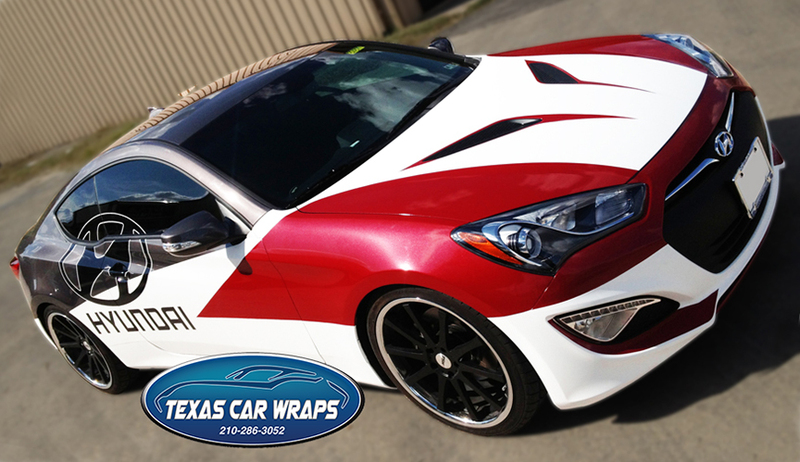 The Hyundai Genesis Coupe is a gorgeous sports car right off the showroom floor, but our client from Red McCombs Hyundai had something unique in mind for their car dealership’s high performance vehicle graphics. First, we applied Avery White Carbon Fiber adhesive vinyl film over about half of the car. Then we accented prominent areas of the hood and front ground effects with Avery metallic Ruby Red film. The long swooping lines were created with the use of knifeless tape to protect the integrity of the vehicle paint. 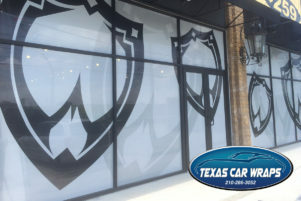 In addition to cutting edge technology, innovative vinyl film application techniques, and specialized films – decades of experience allows Texas Car Wraps to customize your sports car into a spectacular visual treat. All of our vehicle graphics are designed by using sophisticated computer software, and we create a “digital prototype” for our clients to preview in advance of the production phase. Call us to begin the transformation of your car into a “one of a kind” ride. We have many custom vehicle wrap automotive vinyl films in our sample collection to choose from. 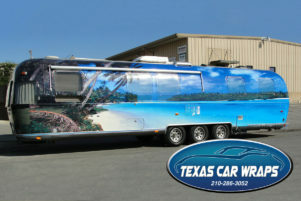 Visit our facility at 12682 FM 1560 Suite 201A Helotes, TX to discuss your custom vehicle graphics projects. Call us at 210-286-3052 for more information. 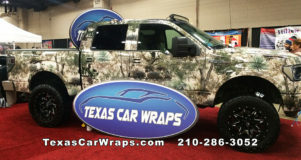 Visit our vehicle wrap website at TexasCarWraps.com. If you are in the market for signs, banners, large format digital printing or sign service in the San Antonio area, visit our sign company website at Eagle Ford Graphics. Next PostHow Much Does a Vehicle Wrap Cost?